You've been trying to figure out where this foul, unbearable stench is coming from in your house, right? You know what it is. A dead animal of some sort that you can't quite locate, as the smell has spread and filled the interior to the brim. Well, then, let's get down to business and find out what could be the most likely culprit behind this putrid reek. Considering that residential and commercial buildings often suffer from an invasion of various critters, with rodents being the winners in the competition for food and shelter, you're most probably one of the unlucky souls, who has to deal with a dead mouse or a rat. So, if that's the case, read on, because, with this post, we'll delve into the ways of finding the carcass and discarding it safely. You'll also learn about how to eliminate the lingering smell of the dead, but still health-hazardous, pest. So, you found a dead mouse… But what does it mean? The fetid stink points at the presence of one rotting body, at least, regardless of how the animal has met its maker. But what this means is that there are others to follow. Mice and rats are no loners. They go about their business in groups. Both types of rodents are fast breeders, therefore, you can find yourself in dire straits, fighting an out-of-hand infestation within a couple of months. The pests will multiply before your eyes and will keep you awake with their gnawing, scratching, scurrying and screeching noises all night long. Therefore, you’ll need to address the pest infestation problem without delay and eliminate outright the entire rodent population. Тhe smelly carcass is emitting a pungent odour of decay and a "bouquet" of toxic gases like foul-smelling of rotten cabbage thiols, methane, hydrogen sulphide, ammonia and pyruvic acid. Well, the smell itself can't really hurt you but your nose. It is unpleasant, to say the least, to scent the stomach-turning whiffs each morning, while munching on your delicious breakfast, right? The leaching out odours of the rodent's decomposing flesh are harmful by default. Still, it's another story that your exposure to those is minimal, as the tiny dead mouse or slightly larger rat is probably stuck somewhere out of reach. Well, they don't bite now that they are dead. Joking aside, the dead animal can no longer transmit a bunch of dangerous diseases directly or indirectly through any of its daily activity. It's dead. But the decomposing process of the carcass is still a threat to your health, as it activates all sorts of harmful, airborne agents and pathogenic bacteria, which can easily find their way into your lungs and digestive system, or to your skin. Furthermore, the dead pest's waste can host some viruses with a long lifespan, which can survive for weeks out in the open. Also, larger critters, such as maggots burrowing away into the dead mouse's insides, pose a significant risk of a secondary health-hazardous infestation. So, to sum it up, always wear protective gear when removing a dead mouse or a rat to avoid becoming sick from any of these horrendous diseases: tularemia, hantavirus and so on. How to Locate a Dead Mouse in Your Home? Up in the attic, etc. And if you’re lucky to discover the rotting carcass, follow the steps below on how to discard it in a safe fashion. Have your protective gear at hand - Put on a protective mask over your mouth and rubber gloves on your hands. This way, you’ll protect yourself against breathing in any germs and getting into direct contact with the animal. Place the body in a sealable plastic bag - You can use some sort of tool or do it by hand. Also, it’s not unwise to pour some bleach over the carcass to disinfect it if you wish. Discard any other contaminated objects and mouse waste - Dispose of droppings, the trap or remnants of the nest, as well as pieces of nibbled-on food and crumbs in another bag. Securely discard everything in the rubbish bin - Put both bags in a bigger big, tie it and throw it away. Disinfect and clean - Clean the surface, any helping tool that you may have used and your gloves with a suitable disinfectant. Discard the gloves in the bin, and then, wash your hands thoroughly with an antibacterial soap. IMPORTANT: Although you may wear a protective face mask during the disposal process, make sure that you don’t release the excess air from the bags when sealing them. Spreading and breathing in harmful bacteria and germs, carried by the mouse, is the last thing you should allow to happen. What if the mouse is trapped in the wall cavity? Unfortunately, the rodent sometimes meets its demise in a hard-to-reach spot, be it under the floorboards, up in the air duct or behind a wall. And often, your only chance to get to the dead body is by using a flexible type of borescope. Say, you think the carcass is stuck somewhere in the wall cavity. You can drill a tiny hole just above the base moulding and inspect the space behind the wall with the optical tool you have at hand. If your investigation fails to reap any results, try a different spot and drill another small hole until you locate the dead pest. When the suspected source of vile smell is likely to be stuck underneath the hardwood flooring, you'll need to remove a floorboard or two and examine the gap between the subfloor and the floor joist. If applicable, check your underfloor area through the floor crawl space access door or vent. And if you believe that the dead mouse is somewhere in the air ducts, turn off your heating/cooling system, remove the vent and then, use your electronic borescope to check your ductwork thoroughly for any rodent carcasses. Ventilate the house - Naturally, the first thing you should do is to air your place well by opening windows and doors. Sanitise surfaces - Your home can do with a good deep clean, anyway, so disinfect and polish all surfaces. Deodorise fabrics - Use a natural odour eliminator spray and treat your carpeting, upholsteries and curtains with it. Use odour removing bags - Earth Care odour removing bags are a good solution, even if you didn’t succeed in discarding the dead body. They don’t mask the smell but eliminate it through a negative charge. Natural bamboo charcoal deodoriser bags work differently but are also effective, if placed around the house in their numbers. Buy an odour remover - Plug-in and standing odour removers with carbon activated filters or any type of HEPA filter device are far superior in eliminating bad odours than various ionic air purifying systems. Consider using ground coffee - Placing fresh-ground coffee in strategic places could be a quick fix to your foul-smelling problem. Get incense sticks - Another inexpensive solution is to light up your favourite incense sticks around your house for a few days in a row. Bake cookies - And why not fill your home interior with the delicious aroma of homemade baked goods, be it cookies, cupcakes or fresh wholesome bread? 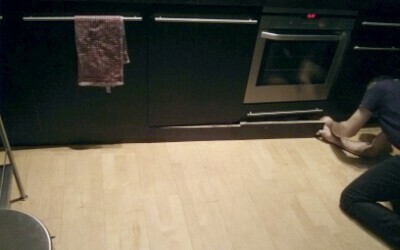 Now you know what to do if you ever find yourself in a dead mouse situation. Still, you can always resolve the pest-related predicament by resorting to professional help. This way, you’ll at least avoid dealing with the ghastly dead animal removal task before attempting to eliminate any odoriferous issues yourself. Want a professional to handle your mice problem? 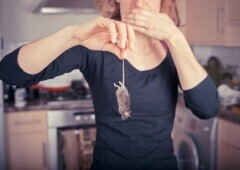 Take into consideration that we only provide some useful tips on how to get rid of a dead mouse smells. We cannot take responsibility if the above suggestions don't work.